DESCRIPTION: Easy to use rubber drain coupler for all types of drains and pipe types. Clamps over outside of pipes. 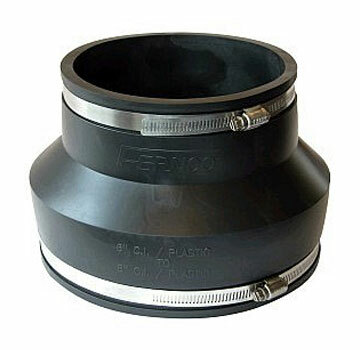 Easy to use rubber drain coupler for all types of drains and pipe types. Clamps over outside of pipes. Unaffected by soil conditions, UV, fungus, and normal sewer gases. Connects pipes of the same or different sizes and materials. Includes 2 stainless steel clamps. Meets ASTM D5926, C1173, and applicable portions of C443, C425, C564 CSA B602 and D1869. Couplings: 2 to 2", 3-3, 4-5, 5-5, 6-6, 8-8. 10-10, 12-12, 15-15, 18-18, 21-21, 24-24, 27-27"
Reducers: 3 to 2", 3 - 3, 4 - 2, 4 - 3, 4 - 4, 5 - 3, 5 - 4, 6 - 3, 6 - 5, 8 - 4, 8 - 6, 10 - 6, 10 - 8, 12 - 10, 15 - 12, 18 - 15".